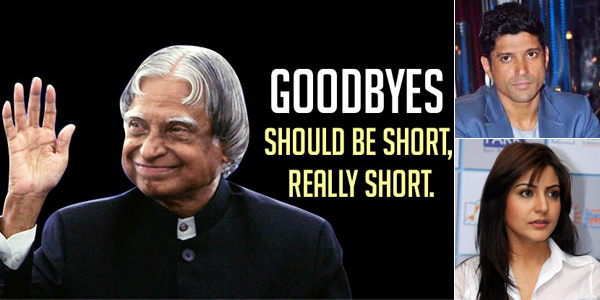 Raaga.com: Are Bollywood celebrity’s condolences to Dr. APJ Abdul Kalam - A Mere Eyewash? Are Bollywood celebrity’s condolences to Dr. APJ Abdul Kalam - A Mere Eyewash? No doubt the sudden demise of our honorable Ex President of India and the great scientist Dr APJ Abdul Kalam shook the nation but what has taken the country aback is the poor and shameful general knowledge of Bollywood stars. More than that it has also raised a question mark on their condolences as to whether they are genuine or merely eyewash!! It began with PK actress Anushka Sharma goofing up with the wrong name of Dr. APJ Abdul Kalam as ABJ Kalam Azad! Interestingly she repeated the mistake not once but twice. First she tweeted as ABJ Kalam and on receiving flak she re-tweeted and this time she added ‘Azad’ in the name of APJ Abdul Kalam! Though she later rectified her blunder and even apologized but what is amazing is that instead of being thankful to her critics, she has threatened to block people making negative comments upon her tweets. Attacking her critics who raised the alarm she lambasted, “They are cowards, faceless people who comment sitting behind a computer. Do that to my face and I will see." While the wounds of Anushka Sharma’s disgraceful general knowledge were still to be healed another Bollywood celebrity add salt to injury!! This time it was brilliant director, actor, writer and singer Farhan Akhtar making another gaffe in his ‘so-called’ tribute to Dr. APJ Abdul Kalam. While Anushka Sharma just added ‘Azad’ in the name of APJ Abdul Kalam, Farhan Akhtar, went a step ahead and transformed scientist APJ Abdul Kalam into Indian freedom fighter Abdul Kalam Azad!!! Ha Ha Ha…. In his tribute to Dr. APJ Abdul Kalam, Farhan Akhtar thus tweeted, "Deeply saddened to hear about the demise of one of the most inspirational Indians of r (sic) time, former President Dr. APJ Abdul KALAM AZAD. RIP." One fails to understand why these film stars make a comment when they are not aware of the personality. With such gross blunders it is evident that most of the Bollywood stars’ (Except few genuine, with due respect.) who tweet on the death of prominent personalities make fake condolences to deceive their fans that they care for the departed soul, while in reality they do not know the ABC of the departed soul! I think their condolences are nothing but eyewash!